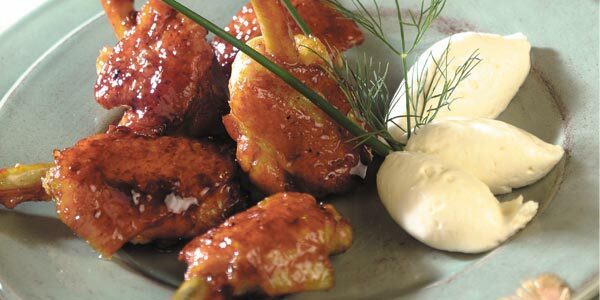 Cook the poultry wings in a frying pan over a brisk heat with the butter and sunflower oil. Brown them on all sides, season them and add the honey and the coriander. Coat the wings well as the mixture caramelises and then deglaze the pan with the Balsamic vinegar, stirring the poultry wings constantly. Once again, ensure that the wings are coated all over and keep on the heat until all the liquid has evaporated. Keep the wings warm while preparing the cream. Whip the two creams up with a whisk, add the honey, the freshly grated ginger and the cider vinegar. Season with salt and pepper and keep the mixture somewhere cold until ready to serve. The wings may be served with an aperitif, dipping them in the cream or you may serve them as an entr&eacute;e with the additional accompaniment of potato purée. * In France, it is possible to buy ready boned-out chicken or poultry wings, under the name of “manchon”, from a charcutier or specialised butcher. The skin is opened and the bones extracted, leaving the meat inside the sleeve (or manchon) of skin. (Boning out is not included in the preparation time.) The primary meaning of manchon is a muff, gaiter or any form of elasticated cuff worn to protect the sleeves while working.